The Game Room, originally thought to be the kid’s hangout, has become a place where adults can enjoy hanging out as well. 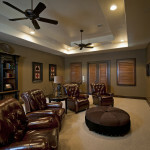 In some cases, the Game Room is combined with the Media Room to create a dual-purpose space. 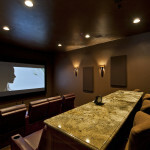 If considering a dedicated Media Room, think about whether or not you enjoy multi-tasking while you watch your movies. If you do, you might consider a dual-purpose space where there is a window or another light source. If you like to hunker down in a comfortable chair and really enjoy the experience of a good movie, then a dedicated media room might be just the thing! 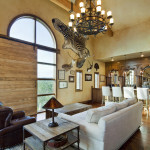 Done correctly, it can be an amazing experience in addition to adding to the value of your home.